This add-on adds support for points purchases via the buyCRED add-on using Coin Payments. Once you have installed and enabled the plugin on your website, the CoinPayments gateway will become available on the Payment Gateways page in the myCRED menu. Here we need to start by entering in our CoinPayments account details and save. Unzip and upload the mycred-coinpayment folder to your plugins folder. 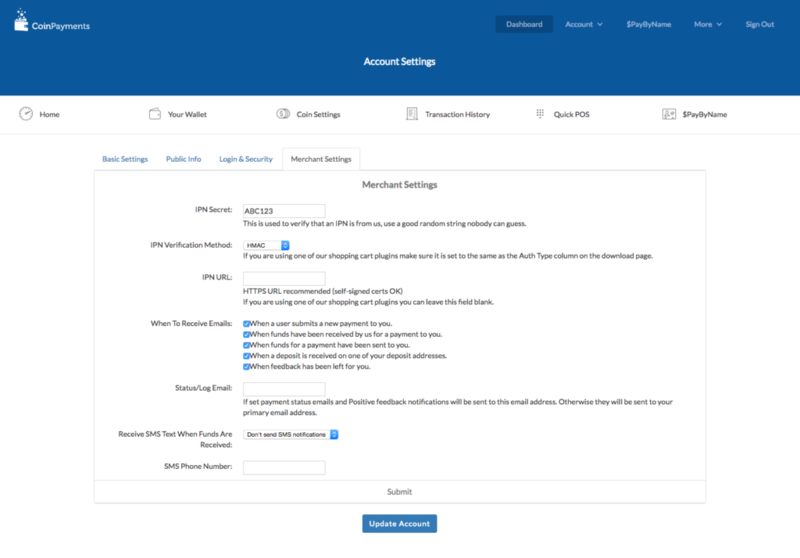 Enable the buyCRED CoinPayments plugin in your WordPress admin area. Click on the “CoinPayments” title to show the gateway settings. In order to pay your users their points automatically, you will need to setup your IPN settings in your CoinPayments account. You will need to copy your IPN secret and add the IPN callback URL you see in your buyCRED settings. IMPORTANT Make sure you use HMAC as authentication and not HTTP Auth in your CoinPayments settings! Once you have setup your IPN notifications you are ready to go. You can use Sandbox mode to make test transaction just remember to disable it when you are ready for real sales. Make sure you nominate coinpay in your buyCRED shortcodes.